A group of historical documents form a body of evidence which allows us to draw conclusions about events and relationships in a person's life, even when those things are not directly recorded in any document. The following includes direct, indirect, and negative evidence that allows us to put together a narrative of the lives of Rider Fields and Katie Vann. 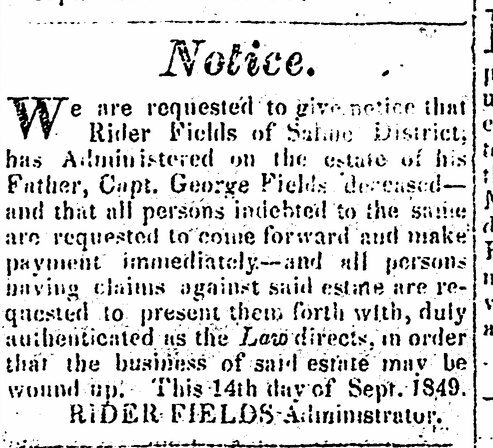 In 1824, Rider Fields filed a claim against the U.S. for property lost four years earlier. Because he was old enough to own property in 1820, yet too young to fight in the Creek War of 1813-14, he was likely born about 1800. This estimation is supported by the fact his daughter, Susan, gave birth to his grandchild, Jane, about 1839. Based on the ages listed for Katie Vann in various U.S. and Cherokee records, she was born circa 1833. According to Ben Vann, Katie's oldest child was born in 1847. Katie Vann would have only been fourteen years old when she gave birth to that child if the estimation of her age is correct. Based on the projected age at the time of that child's birth, we can presume Katie might have been born earlier than 1833 but it is unlikely that she was born after that year. The first time Rider Fields was found on a record that included information about his family was in 1835 on the Cherokee Nation census. He was living in Jackson County, Alabama (the old Cherokee Nation) and had 8 in his family, all quarter-bloods, with a breakdown of one male over 18, one female over 16, and 6 females under 16. 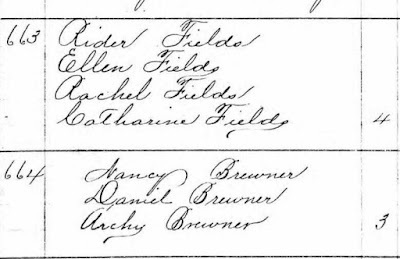 There were no mixed Negroes (an actual question on the census) and Rider Fields had no slaves. 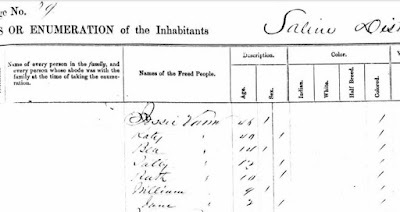 If Katie Vann, the mother of Ben Vann, was the daughter of Rider Fields, she should have been found in his household on this census since she was a child at this time. She wasn't. 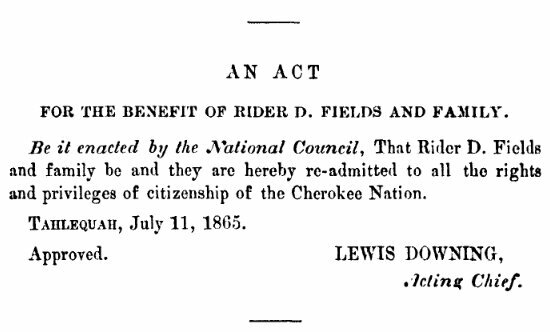 In 1837, Rider Fields received payments for subsistence and transportation for voluntary removal to Indian Territory. He collected money for seven people; his family included six Indians plus he had one slave with him. We cannot determine if Rider owned this slave. We cannot determine if the slave was male or female. All we know is Rider had a slave with him when he removed to Indian Territory. He received a small payment for the use of a wagon, team, and teamster (someone to drive the wagon) during the voluntary removal. Perhaps that is why he had a slave with him. 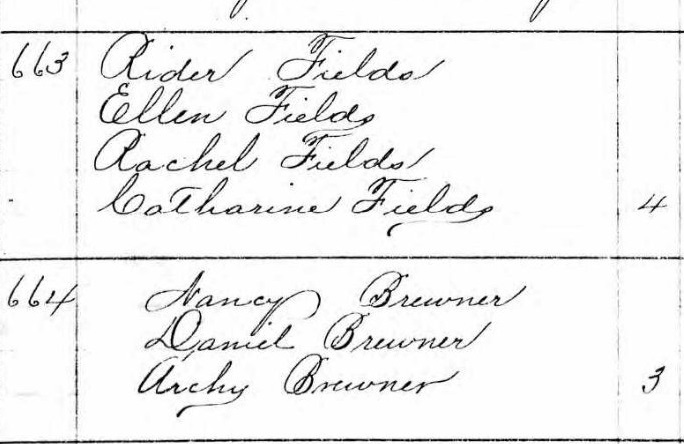 All we know for certain is Rider Fields had a slave with him in 1837 that was not with him in 1835 nor with him in 1839 when he again received subsistence and transportation money, but only collected for five people, no slaves. 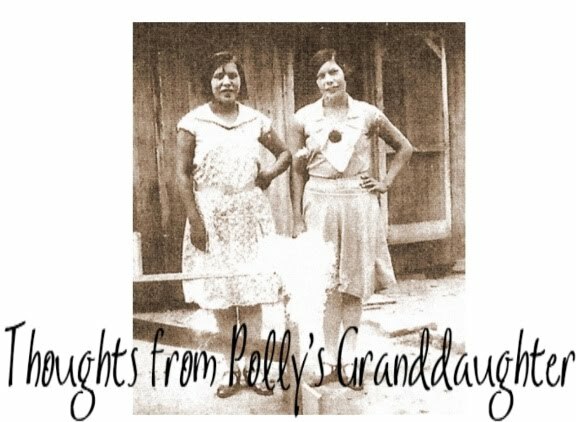 In 1847, the year Katie Vann gave birth to her first child, Rider Fields was living in the Cherokee Nation and filed a claim for improvements and spoliation. Two years later, Katie Vann gave birth to her second child (listed in the records by the names Julia, Juna, and Chick.) That same year, the Cherokee Advocate twice published information about Rider Fields. In July, there was a cholera outbreak near Rider's home on the Verdigris and in September, he was the administrator of the estate of his father, George Fields. 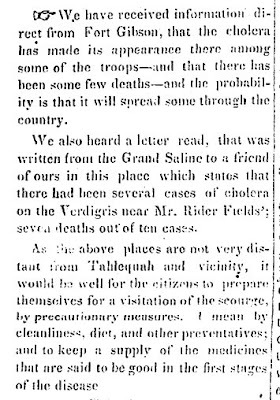 Cherokee Advocate, July 23, 1849. Tahlequah, OK. p2. Cherokee Advocate, September 24, 1849. Tahlequah, OK. p3. When the Drennen Roll was made in 1851-52, Katie Vann had already given birth to her third child. Rider Fields was enrolled by Drennen and living in Saline District with his daughters, Ellen, Rachel, and Catherine. If Katie Vann, the mother of Ben Vann, was the same person as Catherine Fields and she was living in Rider's household when the Drennen Roll was prepared, her children should have been listed too. They weren't. This is strong evidence indicating that Catherine Fields and Katie Vann are not the same person. Katie Vann was not listed on the Drennen Roll in her own household either, suggesting she was not considered a citizen of the Cherokee Nation at that time. Oklahoma and Indian Territory, Indian Censuses and Rolls, 1851-1959, Drennen Roll, Rider Fields, Saline 663, Ancestry.com. By January 7, 1852, Rider Fields was living in the Creek Nation. His daughter, Susan, died about 1850 leaving minor children. Based on later records, it is possible Rider moved to the Creek Nation to take care of her children. Despite Rider's move to another nation, Katie Vann remained in the Cherokee Nation. If she would have been the slave of Rider Fields, one would assume he would have taken her with him to the Creek Nation. He didn't. Katie Vann had two children born in the Cherokee Nation between 1852 and 1857. One of those children was Ben Vann. Rider Fields was still in the Creek Nation after the birth of those two children. He was listed on the 1857-59 Creek Roll with Billy, Peggy, and Bluford (his grandson) in his household. Oklahoma and Indian Territory, Indian Censuses and Rolls, 1851-1959. Creek Rolls, 1857-1859. Ancestry.com. Katie Vann gave birth to her sixth child in the Cherokee Nation in 1859. The next year, Rider Fields was listed on the U.S. Slave Schedule, still living in the Creek Nation, and as the owner of two slaves. Both slaves were male, aged 45 and 5 years old. Clearly Katie Vann was not his slave at this time. 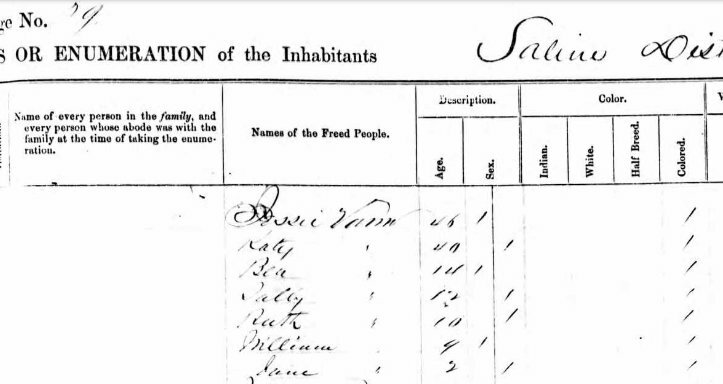 1860 U.S. Federal Census - Slave Schedules, Ancestry.com. Katie Vann had another child, Ruthie, about 1861. Two years later, in 1863, the Cherokee Nation freed their slaves. At this time, Rider Fields was still a citizen of the Creek Nation. He did not become a citizen of the Cherokee Nation again until 1865 when he and his family were readmitted by an Act of the Tribal Council. That year, Katie Vann and her family were found on the Kansas State census and living there. Laws of the Cherokee Nation passed during the years 1839-1867, p. 114. 1865 Kansas Territory Census, Ancestry.com. 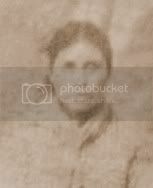 In 1867, while Rider was found on the Tompkins Roll as a "Half breed" Cherokee and living in the Illinois District, Katie Vann and her family were found listed as Freed People, "Colored", and living in Saline District. After this, Rider disappears from records so it is presumed he died between 1867 and 1880. Oklahoma and Indian Territory, Indian Censuses and Rolls, 1851-1959. Tompkins Roll. Ancestry.com. In 1880, Katie Vann was listed on the Census of the Cherokee Nation as adopted colored. Her household included William, Rachel, and Jane. Oklahoma and Indian Territory, Indian Censuses and Rolls, 1851-1959. 1880 Cherokee Nation Census. Ancestry.com. Katie Vann was listed on the Wallace Roll for the Authenticated Cherokee Freedmen (1888-89) living in Cooweescoowee District. This roll was only for Freedmen. Native Cherokees were not listed on it. In 1891, Katie Vann died, according to her son, Ben Vann. In documents, we never see the lives of Rider Fields and Katie Vann intersect. They are never found on any record or in any source together. In fact, while Katie was still a slave and having babies in the Cherokee Nation, Rider Fields was living in the Creek Nation. For thirteen years, from 1852 to 1865, Rider Fields and Katie Vann were not living in the same nation. When Rider Fields is found in the Creek Nation, Katie Vann is found in the Cherokee Nation. When Rider returned to the Cherokee Nation, Katie was found in the United States living in Kansas. 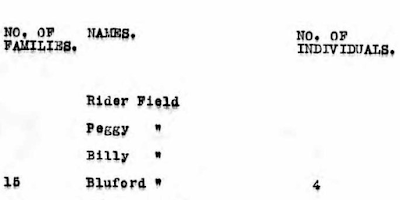 Documents show that Rider Fields had no "mixed blood Negroes" in his household in 1835 nor any slaves. When Rider's daughter, Catherine, was living with him in 1851-52, Katie Vann was married and having babies. When Rider was living in the Creek Nation, Katie Vann, still a slave of someone, was living in the Cherokee Nation. Every document found on Katie Vann indicates she was black, "colored", or a "Freed person." At this point, only Ben Vann's testimony suggests she had Indian blood. Stay tuned for more conflicting evidence and a conclusion to this genealogical mystery concerning this widely accepted Cherokee lineage. 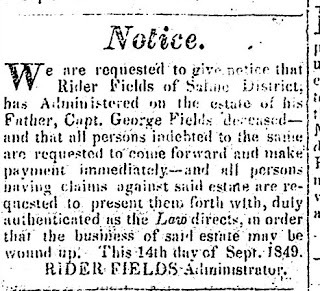 Rider Fields and The Freedmen - Part 3, The Conclusion coming soon.